While historically the voices of minority artists have been largely ignored and overlooked, today artists from these groups are making some of the most exciting, inventive, and powerful art out there. Here are four major black contemporary artists that you should know who are making splashes in the art world today. They include those working in mediums as diverse as traditional painting, video art, and large scale installation. 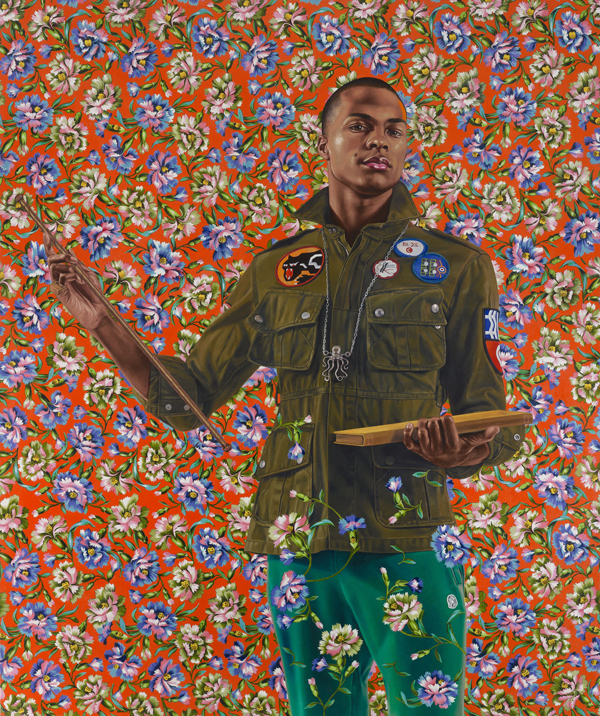 Kehinde Wiley’s fantastical portraits both draw on the genre’s long storied history and conventions, and challenges them with bold juxtapositions and thoroughly contemporary subjects. Wiley’s subjects are usually but not always young black men in today’s fashions from around the world. They are posed against extremely bold, flat patterned backgrounds that evoke decorative paper and luxurious brocade fabric. This approach gives his paintings an instantly recognizable style and grounds his work very much in “the now”. Quite simply, his awesome, monumental portraits challenge stereotypes of black men in today’s society, and bring the black cultural experience and black masculinity into the forefront of art, where it has been infrequently seen before. Kerry James Marshall is another artist whose work heartily asserts black identity and history against a record of oppression and absence from the artistic canon. His paintings are large scale, colorful, and full of motion; they feature exclusively black subjects and history. 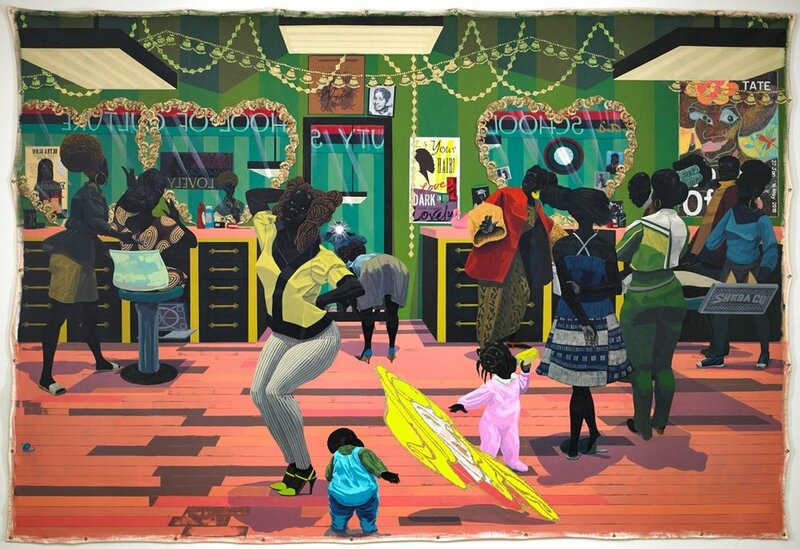 Many show every day sorts of locations, like barber shops, gardens, and diners, and Marshall has been adamant throughout his long career that his work sets out to bring more of the black perspective into fine art such as simply daily life. He explores subjects both cheerful and dark, but all with a strong commitment to bright color, and references to famous works in Western fine art canon as well as styles of black folk art. Works going for millions of dollars and hanging in major museums across the country including an upcoming retrospective at the MET Breuer prove his mission has gone well. Drawing acclaim, controversy, and a MacArthur Genius Grant for her work almost straight out of grad school, Kara Walker is an artist who too has a very signature style for most of her works. She utilizes large scale black paper silhouettes against white backgrounds to explore largely grim scenes from the history of slavery. There is violence, both physical and sexual, as well as plays on many offensive historical black stereotypes within her subversive take on historical paintings. So, despite the ambiguity inherent in the silhouette medium, one can quickly put together the horrible reality. Walker’s work continues to be controversial for these reasons, but it is doubtless that her embrace of narrative and unflinching commitment to keeping the horrors of slavery and its legacy in alive in our minds is effective. And now, for something completely different - Ethiopian born American artist Julie Mehretu is a contemporary abstract expressionist. Her large works embrace gesture and layering, and take the fast moving world of 21st centuries cities as inspiration. Within them, frantic lines and colorful shapes seem to be on the verge of zooming past one another. Mehretu works in many layers of pencil, ink and paint to achieve these contained chaoses with many individual interplays of marks throughout. In 2009, she was commissioned by Goldman Sachs to create a massive, 80 foot long mural for one of their buildings’ lobbies, finally titled Mural. Its boldness and scale is a testament to her ambition as an artist and her ability to transform intangible inspiration (in this case, the history of capitalism) into bold abstract imagery. Between the underrepresentation of minority voices in the arts and the frustratingly resilient impediments to black progress & security ingrained in American society today, black artists such as the ones mentioned above have had to contend with a lot on the road to success. The powerful, original works created by them challenge all these obstacles in the striking way that only visual art can, and have given them the acclaim they rightly deserve.